As a family we strongly believe in working with the natural environment rather than against it. We love the great outdoors and are passionate about preserving the British countryside for future generations. As a business we are always looking for ways to reduce our impact on the environment and to recycle and reuse natural resources. We moved to our current nursery in 2006 and we are proud of the the steps we have taken so far to reduce our environmental footprint. As soon as we moved in we installed thermal screens to minimise heat loss. In 2010 with the help of an EU grant we installed rainwater harvesting at the nursery and in January 2014 we installed a more sustainable biomass heating system to replace the old oil fired heaters. We have always used recycled paper in the office for our care instructions and greeting cards, for any promotional material, leaflets and envelopes. From the beginning we have choosen packaging that is based on recyclable paper and cardboard rather than plastics or cellophane and we are constantly looking at ways of improving our sustainability. Our current boxes are made from 80% recycled material and all of our tissues and kraft papers are made using paper from sustainable sources. We have introduced a new smaller box size this year which has helped to reduce the amount of cardboard we are using and we have also introduced a kraft paper 'padding' in our boxes which is made from 100% recycled paper. 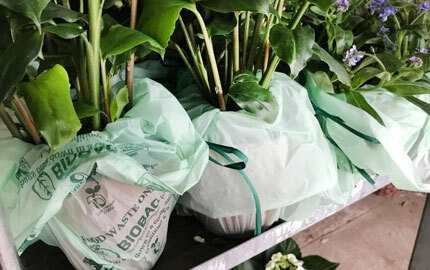 Looking forward we are working hard to becoming truly plastic free and we are delighted to have already replaced the plastic bags we used to hold in soil and moisture in transit with new biodegradable and compostable starch bags and the plastic seals on our gift wrap with paper alternatives. Our greeting cards are currently in a biodegradable plastic document wallet but we are looking again at other alternatives for 2019. We try to take a holistic approach to waste management and recycling. We reuse everything that we can including plastic pots, water and office paper and what we can't reuse, we recycle. 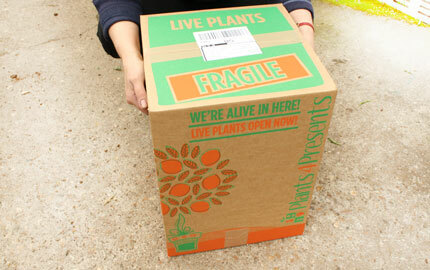 All discarded office paper, cardboard packaging and plastic pots and plant trays are collected from site for recycling. We compost all food and plant waste to make our own compost for cut flower production. The soil association doesn't recognise any potted plants as organic however we do practice organic principles in everything we do. We only use organic plant based insecticides and use natural predators (and our trusty farm cats!) to manage pests within the nursery. We use peat free compost in all our own re-potting and use a mixture of organic and non-organic feeds to keep our plants strong and healthy.